It’s no secret the war for talent has reached new heights of competition as companies in all industries and phases of growth vie for the attention of Millennials as well as experienced professionals. 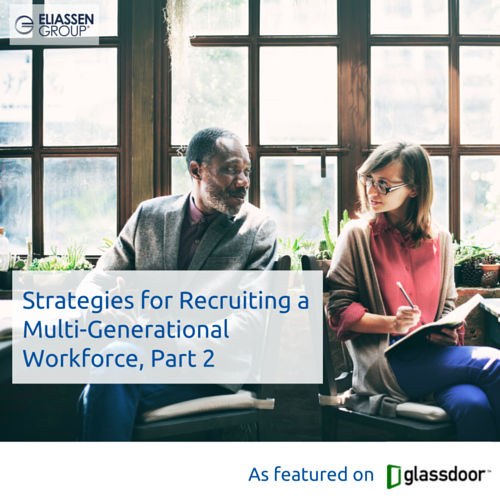 In Part 1 of this series, I discussed taking a holistic approach to recruiting and retention that not only considers Millennials but looks across the entire workforce spectrum to ensure companies are implementing programs and benefits that will appeal to all employees at every phase of their careers. After all, what an empty-nester will consider critical in a career opportunity is not the same as what a mid-level manager with two young kids will find important. In Part 2, I focus on the mid-career phase and an older demographic, Generation X, and what you should you be considering to attract and retain this group. Gen X is commonly defined as “the generation born after the Western Post-World War II baby boom,” roughly the early 1960s to the early 1980s. A study by EY found that members of Gen X possess traits like “adaptability, problem-solving, collaboration and effective management.” The same study found that Gen Xers ranked workplace flexibility as the most important “perk” and are more likely to walk away from job opportunities where flexibility is not part of the equation.